Pierre Kunz's story is the source of inspiration for every person, involved in the watchmaking industry. The way of Kunz, the talanted watchmaker, seems to be a traditional one. He studied in the celebrated Vallee de Joux watchmaking school and learned the secrets of horology at an early age. Having finished his studies, Pierre Kunz worked in the workshop, that was involved in the production of mechanical complications. However, the name of this brand is not widely known, because it has never produced the models, called Victorian Piguet. Victorian Piguet company constructed complicated basic mechanisms, and such elements of the movements as repeater, perpetual calendar, single-bottom chronographs and so on. In this workshop Kunz was constructing such complicated movements. The years, that he spent in Victorian Piguet and later in Franck Muller Group companies, helped the watchmaker to fulfil himself. One interesting fact, concerning the foundation of new Pierre Kunz company, should be mentioned here. The matter is, that the watchmaker's ideas were so highly appreciated by the public, that the management companies gave Kunz an opportunity to establish his own brand within the scope of Franck Muller Group. Pierre Kunz managed to create absolutely exclusive models, extremely complicated. More over, he gave a dare, having developed such incomparable masterpieces. The watches, created by him, became the embodiment of 20-year experience in the sphere of the perfect mechanisms development. Kuns has brightened up the strict classical mechanics by adding one or several zones (sub-dials), at the same time maintaining the clearness and simplicity of the time reading systems. For many years a lot of watchmakers have been trying to combine as many complications as possible in a single model. In addition, the numerous sub-dials, windows and hands can disorientate a person, so it would be more difficult to determine the time. Pierre Kunz managed to solve the assigned task, having created the super-complicated watches with the original dials, that allow you to read the time easily. The fist collection of men's wrist watches was released in 2002, and it was presented at the World Presentation of Haute Horology for the first time. All the models from this collections were sold out. The collection consisted of 20 watches, equipped with the automatic movements. The watch cases, decorated in the Empire style, were made of white, yellow gold or platinum 950. The watch design with the symmetrical shapes and clear lines didn't allow to combine a great number of functions. However, the first collection included the men's watches with the retrograde hours, minutes, lunar calendar, sector dial, the equation of time, showing the difference between the apparent solar time and mean solar time, minute repeater, turbillion, perpetual calendar. In one of his watches Pierre Kunz has managed to combine numerous functions: minute repeater, that chines the hours and minutes, tourbillion, that aims to negate the effect of gravity, and sector perpetual calendar. Every sector (zone) of the dial is guilloche. The filigree engraved movement is viewed through the transparent watch back. Every model, developed by Pierre Kunz, is exclusive. For example, Vertigo Sport (Ref: R020 Sport) watch is rather an unusual regulator. The square watch case, 43 mm in diameter and 13.5 mm thick, is produced from stainless steel. The square dial is divided into three unequal parts: the minute hand is located in the upper right corner, under it there is a small second counter, that is presented by the clockwise rotating disc. There is a retrograde hour indicator in the left zone of the dial. The dial is protected by the sapphire crystal. The watches come with the rubber strap and the deployant buckle. The water resistance is 100 meters. Vertigo Sport watch is equipped with the Swiss automatic PK 2001-1544 movement, based on the ETA 2892-A2. The frequency is 28 000 vph, the functions are hours, minutes, seconds. Let's discuss the other model from Pierre Kunz collection – Spirit Diver (Ref: G021 Sport) watch with the steel round case, 44 mm in diameter and 13.5 mm thick. The case is trimmed with a toothed bezel with the 60-minute scale, turning in one direction, a depthometer and a screwed crown. The dial is covered with the sapphire crystal. The water resistance is 100 meters. The model with a rubber strap and folding buckle is equipped with the Swiss automatic PK 2001-1516-B movement, based on the ETA 2892. The movement has 25 jewels and operates with the frequency of 28 800 vph, the functions are hours, minutes, small second hand, depthometer. Second Time Zone (Ref: A017 FHR GD) watch is the embodiment of the designer's fresh ideas, reflected on the watch dial. The round watch case, 44 mm in diameter and 11.85 mm thick, is produced from gold 750. The sun-brushed dial with the Arabic numerals, three hands and date aperture at “6:00” is covered with the sapphire crystal. The watch comes with the leather strap and a plain buckle. Second Time Zone (Ref: A017 FHR GD) watch is equipped with the automatic PK 2001-1523 movement, based on the ETA 2892, and has 38 jewels. The frequency is 28 800 vph, the functions are hours, minutes, grande date, retrograde second time zone, day/night indicator. 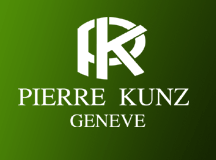 It's worth mentioning, that the wild success has not influenced on the style and quality of Pierre Kunz watches. The watchmaker continues to create the same exclusive masterpieces with several watch functions. The philosophy of his work remains unchanged, that is the challenge to the nature and space, the combination of grand complications in a small wrist watch. There is nothing impossible for Pierre Kunz. This fact is proved by his unique watches. But never the less, the watchmaker is not going to stop at what has been accomplished, he is striving for perfection. According to the watchmaker, “his mind never stops to generate the ideas, to think and to create. He is working for 24 hours a day. Sometimes an idea occurs to him even while speaking to someone. These ideas must be embodied, new movements and variations of the design must appear. And all these efforts are taken to create a watch, that has never been developed”. Just take a look at Pierre Kunz's inventions, and you will understand, that the watchmaker's imagination has no limits. He assembles the prototypes of his models by hand and finishes the movements by himself. Pierre Kunz's watches are the beautiful models of your dreams, every detail, even hidden in the watch case, is perfect. One is likely to fall in love with such a wonderful dream. Meanwhile the watchmaker continuous to create the masterpieces and says, “my goal is perfection. I'll try to develop even more complicated watches”.